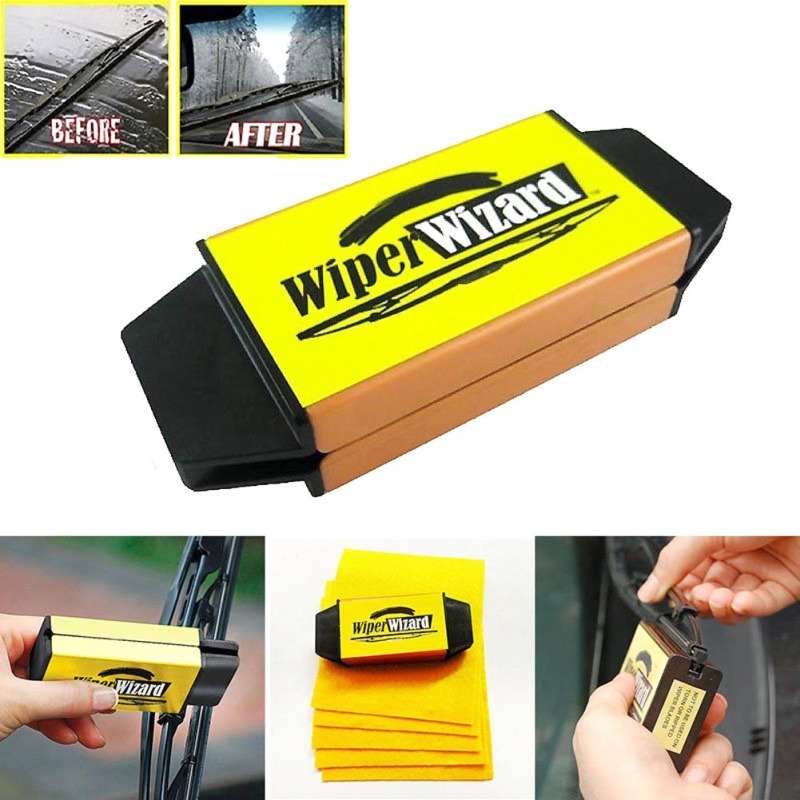 Wiper Wizard transforms your car's streaking, creaking windshield wipers from rough to solid in seconds! Wiper Wizard will clean and sharpen your car's windshield wipers, restoring the contact surface for maximal performance! Save money on new wipers and improve safety! Wiper Wizard is very easy to use, and will completely transform your driving experience on rainy & snowy days! The Wiper Wizard will save you the hassle of changing your wiper blades, save you money and improve drivability and safety. The Wiper Wizard will clean and sharpen the blades restoring complete windshield contact for better performance. Just simply slide the Wiper Wizard onto the edge of the wiper blade and slide back and forth over the entire blade. Then just wipe away any excess debris with the included microfiber cloths. Your wipers will work like new again maintaining visibility and improving driving performance. The Wiper Wizard has scientifically engineered microcrystals that smooth away those rough edges that cause dangerous streaking. Easy to use just swipe blade through the Wizard. Safe and effective on all wiper blades. The Wiper Wizard will save you the hassle of changing your wiper blades, save you money and improve drivability and safety. The Wiper Wizard will clean and sharpen the blades restoring complete windshield contact for better performance. Wiper Wizard transforms your streaking, creaking wiper blades from rough to solid edge in seconds! Prolong the life of your wiper blades with the Wiper Wizard! Sharpens, cleans and restores your existing windshield wiper blades saving you time and money. The Wiper Wizard will clean and sharpen the blades restoring complete windshield contact for better performance.